OK, now let’s get started! 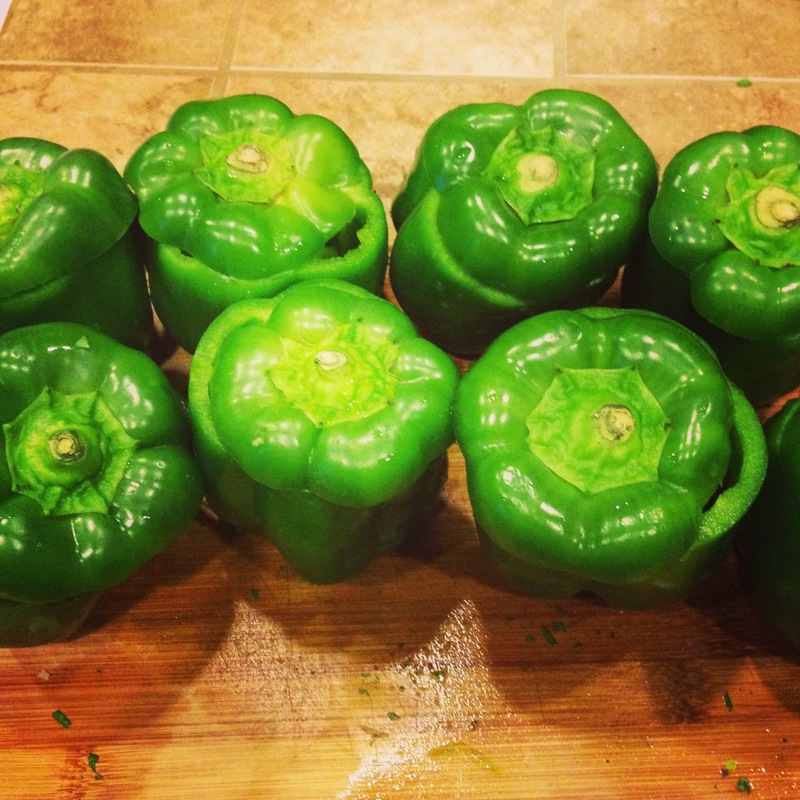 First, you want to wash your bell peppers, dry them off, cut off their tops and remove the seeds. You can choose to use the tops but I decided not to. Then, bring a large pot of salted water to a boil and parboil your bell peppers in there for 5 minutes. This is an important step, as it really softens the bell peppers in a way that the oven won’t. If you skip this step, your bell peppers will turn out crunchy, so, be forewarned. While the bell peppers are boiling, cook your rice. You can use a rice cooker or cook it on the stove, like I like did, since it’s a huge time saver. I used 3 cups of water for 2 cups of rice, salted the water, and added a tablespoon of olive oil. It took about 15 minutes for my rice to get fully cooked. After the bell peppers have boiled, pour the pot of bell peppers inside a colander to drain. Remove with tongs (as the bell peppers will still be extremely hot), and pat dry with a paper towel. Set aside and let them cool slightly, while we move on to preparing the stuffing. 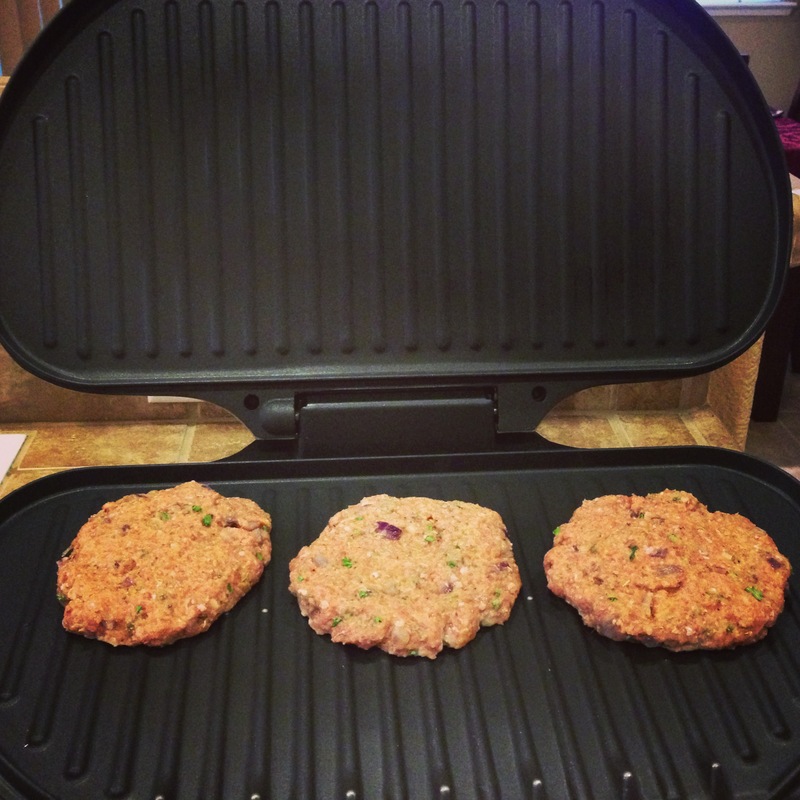 In a large nonstick pan, cook the ground beef. Drain the fat in a bowl to discard later. Add a tablespoon of olive oil and saute the mini bell peppers until soft, along with the onions, until translucent. Add the diced tomatoes. Mix in the rice. 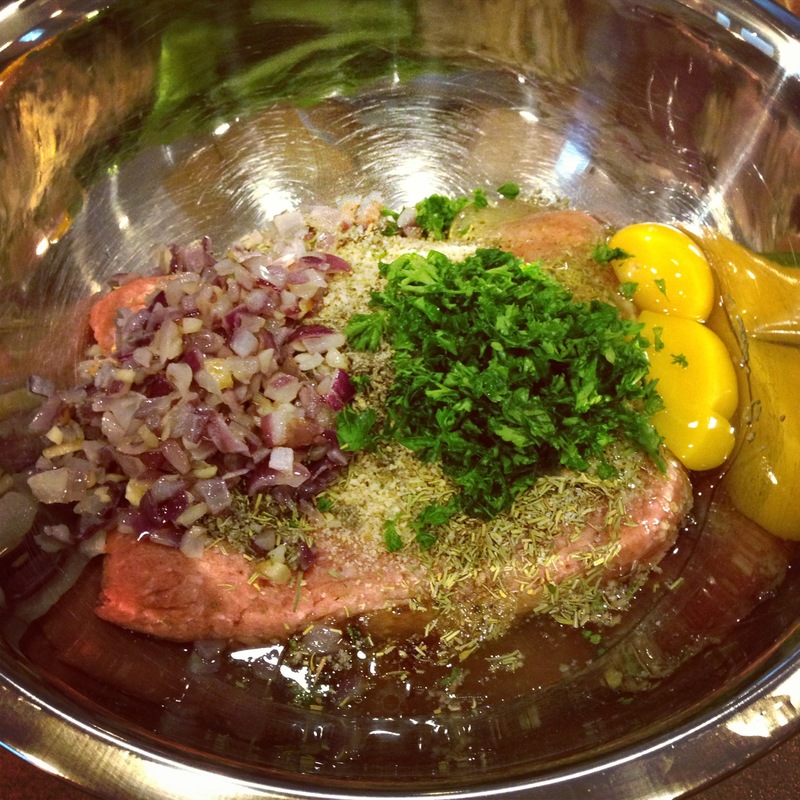 Add salt and pepper, Italian seasoning, basil and oregano along with the fresh garlic. Add garlic powder and a tablespoon at a time of Worcestershire sauce, until it starts giving the stuffing that strong flavor that Worcestershire sauce is known for. Add the cilantro. I used a 13 x 9 glass Pyrex, sprayed the bottom with Pam, then, covered the entire bottom of the Pyrex with pasta sauce. 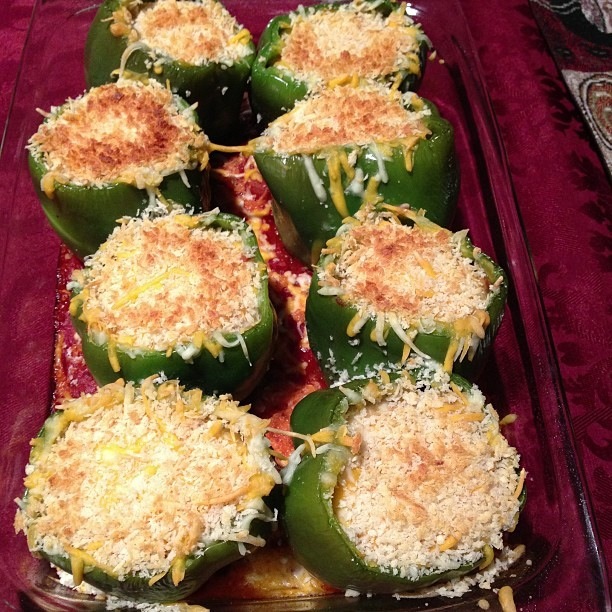 Grab each bell pepper, sprinkle the inside with sea salt, as well as a mixture of both the cheeses. Spoon a little bit of the stuffing inside the bell pepper, layer with some pasta sauce on top, add more of the stuffing, and finish with more pasta sauce. Place the bell peppers inside a 350 degree oven. After 25 minutes of being in the oven, take them out, sprinkle them with more of the two types of cheeses (but, this time on top), along with the Panko bread crumbs, and put them back in the oven for 10 more minutes. Then, broil for 3-4 minutes or until the bread crumbs are brown and toasted. Who doesn’t love some melting, cheesy goodness? Best of all, if you have leftover stuffing that you couldn’t use for the bell peppers, you can always eat the stuffing the next day just like that. It really does taste that good. 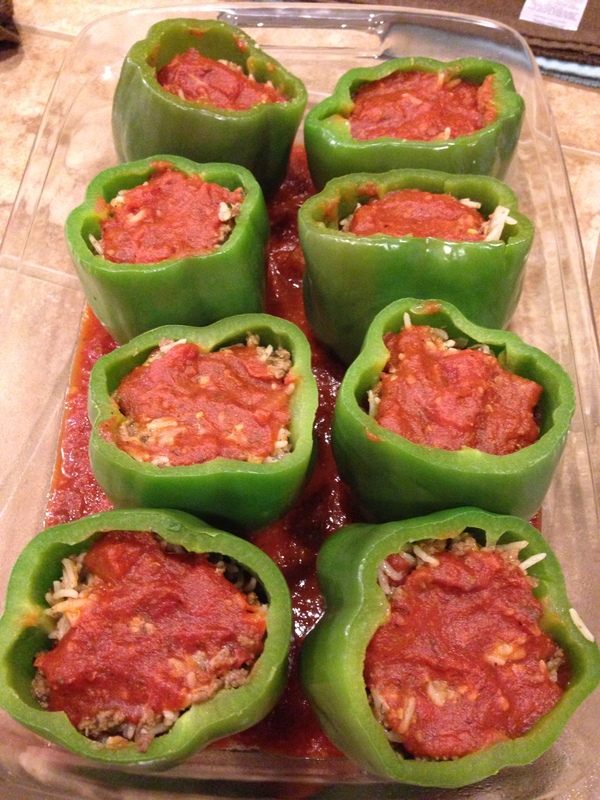 According to my husband, these stuffed bell peppers were amazing! I am sure they will be a hit in your home, too. One afternoon, after getting off of work, I wanted to make something tasty but had limited ingredients on hand. I rummaged around our pantry, fridge, and freezer, in dire need of The Creativity Fairy to hit me on the head with her magic wand and throw me an idea. And, that’s when she made her appearance and did just that. I found some lean ground beef, had some vegetables on hand, and decided to make my first ever beef and zucchini curry. Black pepper, and lots of it! 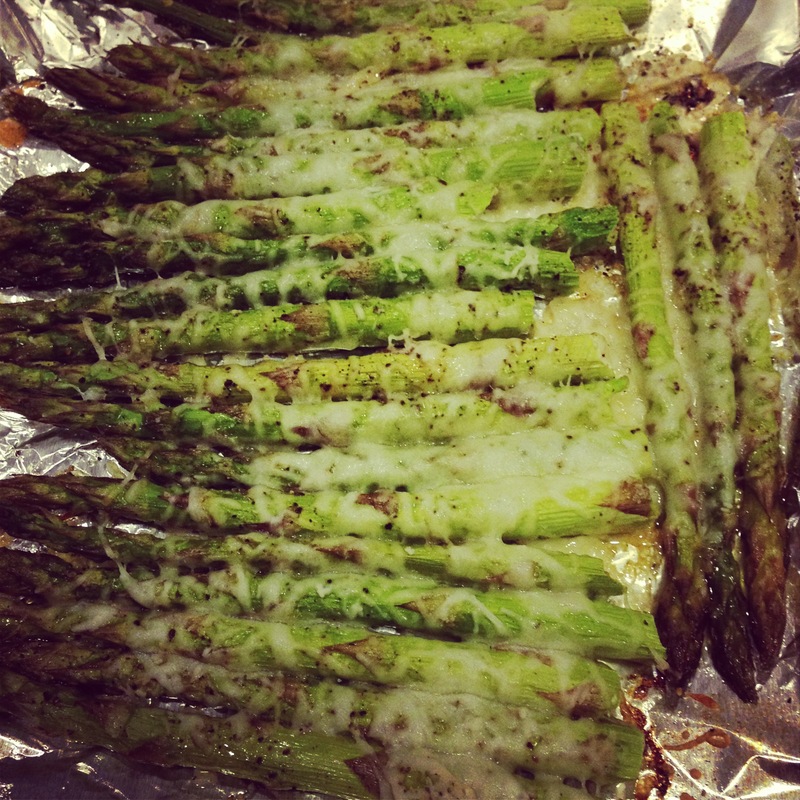 In a small nonstick pan, add a tablespoon of olive oil and the zucchini, sauteing until soft. Set aside. 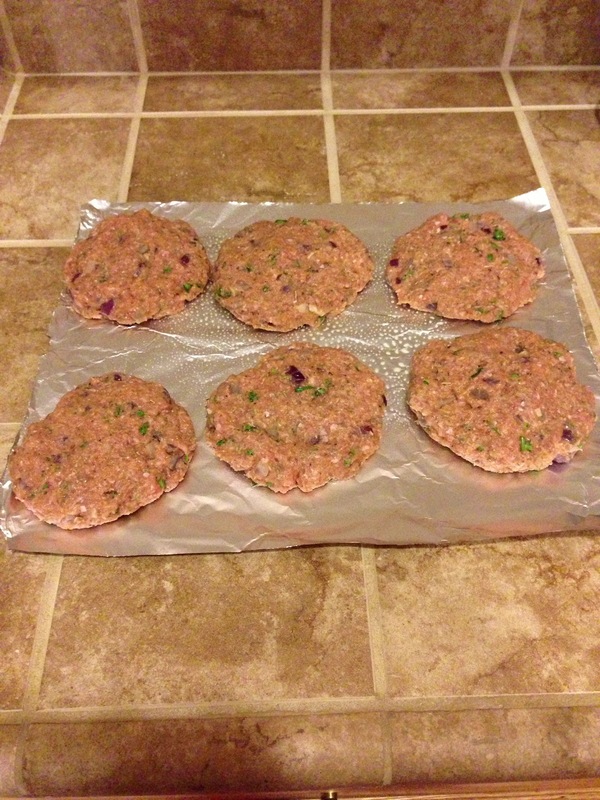 In a large nonstick pan, add the lean ground beef, breaking it up into small pieces, and fry it until well done. Drain the fat in a bowl and discard later. 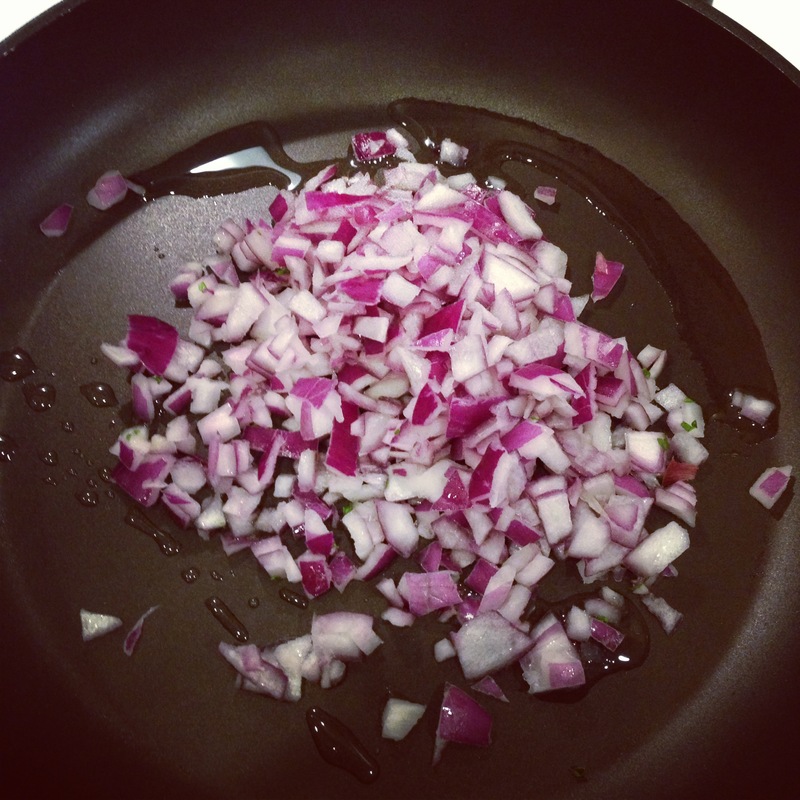 Add a small amount of olive oil to the pan, add the onions, sauteing until soft and translucent, as well as the bell peppers. Transfer the zucchini from the small pan to the large pan. Add the tomatoes, diced green chiles, and garlic. 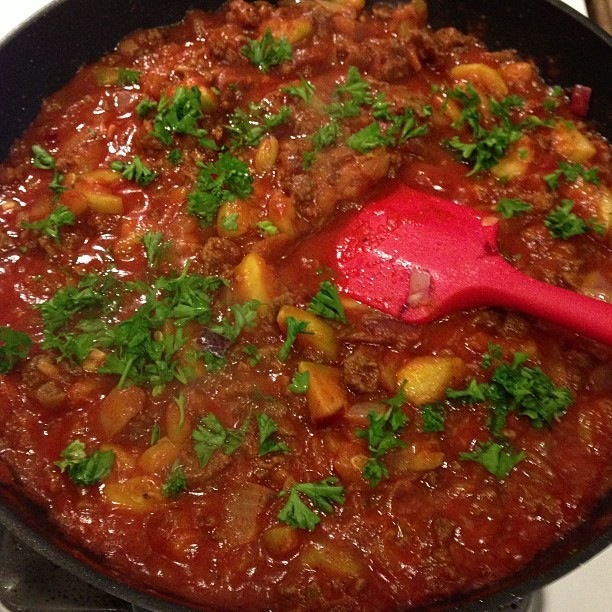 Add the tomato paste and mix it with the rest of the ingredients inside the pan. To thin out the sauce, add 1 1/2 cups of water. Add the ground ginger, spice mix for tandoori chicken, salt and lots of black pepper. Simmer on low heat for 30 minutes, so that the flavors all blend together. 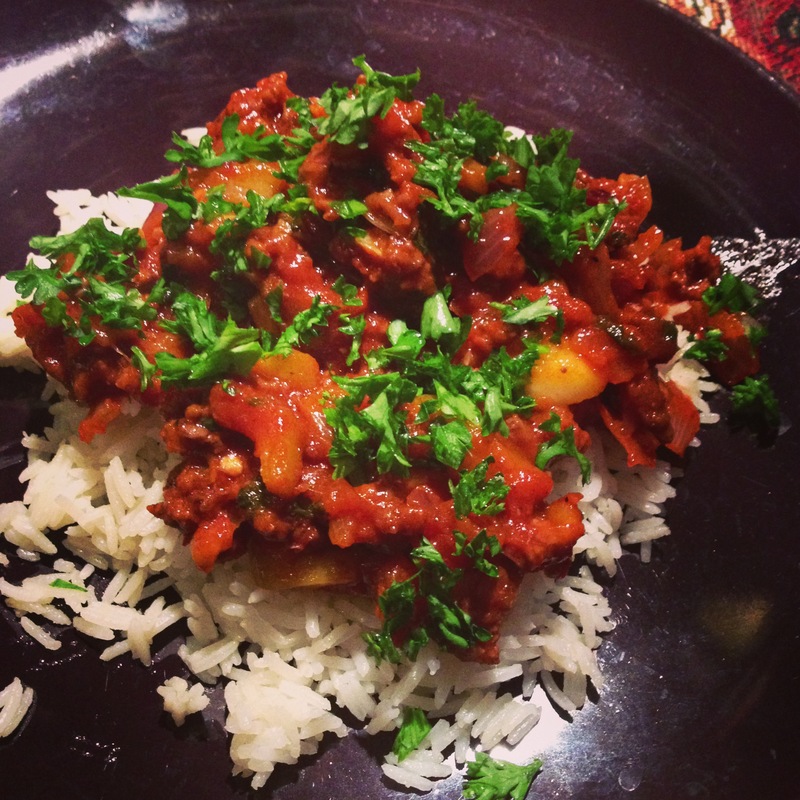 Add chopped parsley on top, while the simmering is taking place, to add bold flavor. 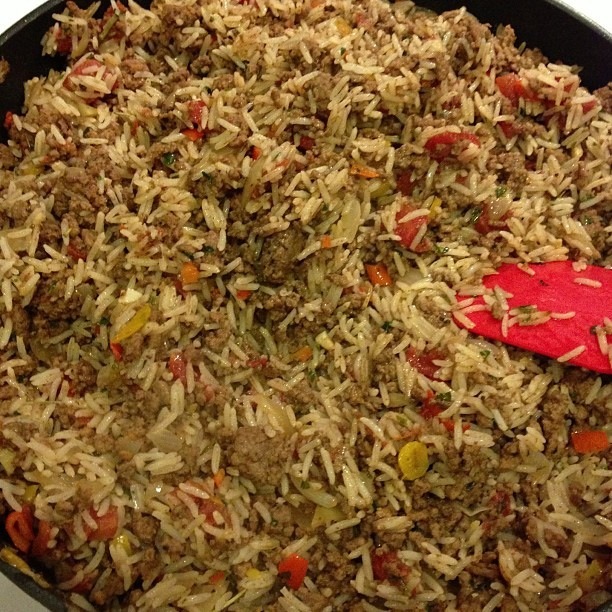 Remove from heat, garnish with more chopped parsley, and serve on top of steaming hot rice. My husband absolutely loved this dish and told me it tasted just like his mom’s cooking. I hope your family enjoys this simple, yet, delicious, recipe, too. My love affair with cooking began only a year and a half ago. Growing up, I never had a defining moment where I knew I loved cooking. In fact, growing up and living at home with my parents, I always left the cooking to them. My parents worried what I would do when I got married, since the only things I had ever cooked up in the kitchen were eggs and, at best, a mean batch of pancakes. However, when I got married in 2011, things changed, and they changed quickly, at that. I developed this innate desire to provide for my husband through cooking him delicious dishes that he would relish. And, with each dish I made, I created a goal to outdo myself the next time. 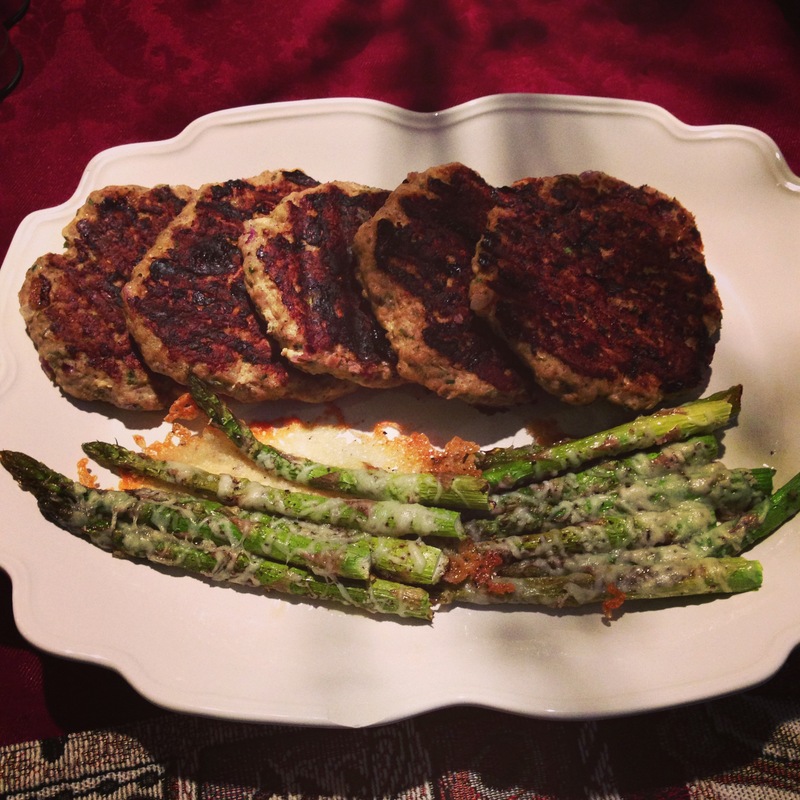 My husband was genuinely surprised how tasty my cooking was, especially since he, too, knew my reputation of never having cooked at home while living with my parents. Soon, the, “This tastes good,” remarks, changed to, “This tastes amazing, just like my mom’s cooking!” There’s a certain satisfaction a woman gets when her husband, as well as those around her, enjoys her cooking. Little by little, I started experimenting, looking up recipes on Google, and putting my own spin on them. Growing up and eating my mom’s food, I would ask her how she made certain dishes; I would then demand her to give me exact measurements. When she told me she didn’t use exact measurements in the kitchen, I was puzzled. How could she not use exact measurements? I thought. Only now, many years later, have I come to realize that the true art of cooking consists in not having to use precise measurements. By no means am I a chef but I do feel I am a self-taught cook, and a good cook, at that. I’ve come to learn that with cooking, there isn’t always a clearly defined recipe to succeed and make great dishes. Rather, it’s about letting your creative juices flow and having some fun in the kitchen! It’s also about taking risks and not being afraid to try new things by throwing new flavors together. 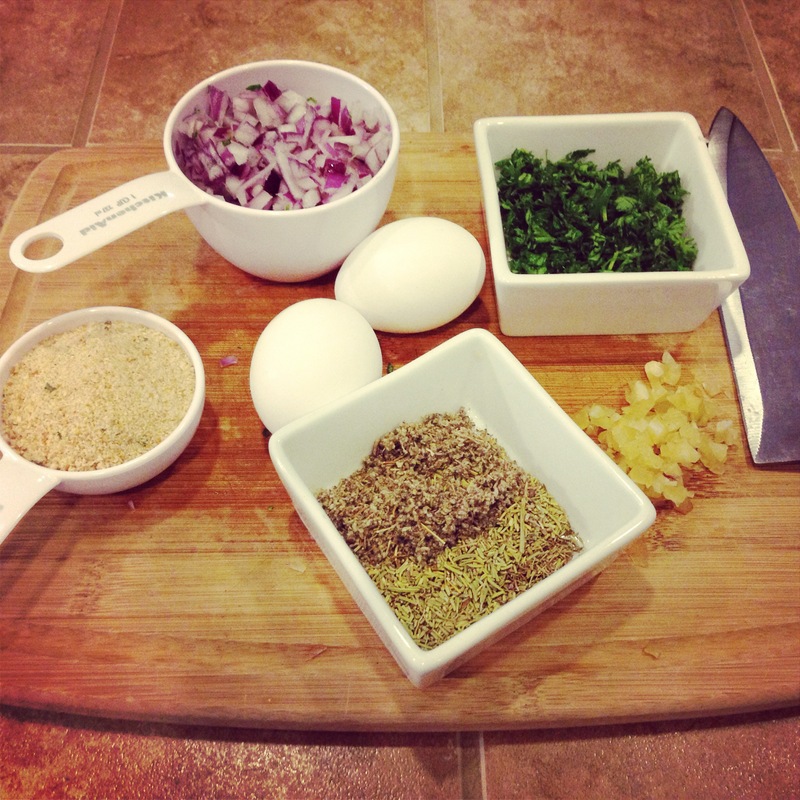 I hope you all enjoy my recipes that I will be sharing on here, from my kitchen to yours!